Despite recent reports of disappointing Blu-ray sales of seemingly sure-bet TV programs such as The Simpsons and Star Trek: The Next Generation (disappointing relative to studio expectations, that is, not units sold), CBS/Paramount has nonetheless forged ahead with I Love Lucy crammed, as before on DVD, with animated menus and scads and scads of extra features. The durability of I Love Lucy didn't seem so strange when this reviewer first started watching it, as a child less than 15 years after the show had ended. Star Lucille Ball was still very active, black-and-white reruns and old movies were still commonplace; it didn't seem at all like an ancient artifact. Now, 64 years (!) after its debut, I wonder. Does it still attract younger viewers, or does its audience today consist entirely of aging baby boomers? Would a younger crowd "get" stories built around the then-wild concept of housewives becoming breadwinners while their husbands stay home and do the cooking and cleaning? Stories about Lucy exceeding the "allowance" her husband provides her? Would they understand the novelty of buying a television in 1952? Ricky Ricardo's (Desi Arnaz) glamorous job as a nightclub entertainer? Would they even know what a nightclub is, in the early-postwar sense? And what about politically-incorrect episodes such as Ricky's "Indian act" at the Tropicana Nightclub, donning blackface in a celebrated episode, or a show revolving around Lucy's mysterious black eye? Partly the love people still apparently have for Lucy is born out of nostalgia. Randomly select any I Love Lucy episode and I'd bet the majority of the U.S. population would remember the plot five minutes in. The show was for at least half a century a rerun staple, maybe the rerun staple in the history of the medium. In the Detroit market where I grew up episodes of I Love Lucy ran as frequently as 12 episodes per week. Back in those pre-cable, pre-Internet days viewing options were but a tiny fraction of what they are now, and I Love Lucy was the default choice of many when the only other options were soap operas and game shows. Partly through the familiarity of repeated viewings, partly on its own merits, there are perhaps a dozen or so I Love Lucy highlights engrained in our collective consciousness. I Love Lucy: Ultimate Season 2 has more than its fair share: Lucy Ricardo (Ball) and best friend Ethel Mertz (Vivian Vance) working the conveyor belt at a chocolate factory, overwhelmed by the product whizzing by; the Ricardos and the Mertzes (Ethel and her curmudgeonly husband, Fred, played by William Frawley) duking it out over a old washing machine; Ricky's slow-on-the-uptake realization that his wife is pregnant; the chaos that erupts when Lucy needs to be taken to the hospital to give birth; the sentimental "Lucy's Last Birthday," which concludes with Ricky lovingly singing the show's theme song for the only time during its run. Watching it now, for this reviewer anyway, is a strange experience. I hadn't seen any of these shows in 30 or more years yet remembered them like I'd last seen them last week. Though purely in television comedy terms I don't think it holds a candle next to other ‘50s greats like The Honeymooners, Your Show of Shows or Sgt. Bilko, I still found myself laughing out loud here and there, and the performances and production savvy of I Love Lucy still impresses, though I found myself equally fascinated by just how much more locked into 1950s the show seemed, how dated it had become in big and little ways. I Love Lucy (1951-60) forever changed the television landscape in myriad ways, many having little to do with the show itself. It reconfigured the legacies of its stars, for one. Heretofore, Desi Arnaz had been a Cuban bandleader, a not-insignificant force in the ‘40s Mambo movement. But beginning with I Love Lucy Arnaz became one of television's most important and innovative producers. Among other things he helped create the "three-camera, live-on-film" style of sitcom production still in use 65 years later. He leveraged I Love Lucy's runaway success to set precedent-making deals in the marketing of reruns (I Love Lucy is without doubt the oldest network show still widely rerun), and with then-wife Lucille Ball created the television empire that was Desilu. Consider this: Without Desilu (and Ball's somewhat bemused support) there probably would never have been Star Trek or Mission: Impossible franchises. Were it not for I Love Lucy, the former second-tier Hollywood star would be no more a household name than, say, Priscilla Lane or Virginia Grey (the latter a longtime friend of Ball's). Within Desilu she built her own Kingdom of Lucy, a constant TV presence that lasted until 1974 when her third sitcom, Here's Lucy, finally ended. All these years later she's still regarded as the First Lady of Television. I Love Lucy's origins, like many a ‘50s sitcom, were in radio. Ball was starring in a weekly series called "My Favorite Husband" that seemed destined for television, but Ball would only agree if real-life husband Desi Arnaz rather than radio husband Richard Denning could appear opposite her. Ball was by this point middle-aged and wanted to rein in her husband's notorious philandering and carousing. She hoped a TV series that her husband would also produce would keep him occupied. The series was picked up by CBS through unfortunate circumstances. The fine comedy-drama The Goldbergs was suddenly dropped when creator-star Gertrude Berg refused to fire the man playing her husband, blacklisted actor Philip Loeb. Ball herself was later accused of being a Communist sympathizer but survived the witch-hunt. That I Love Lucy enjoyed ratings so high at one point it was pulling in more than 70% of the viewing audience no doubt helped. The series was sponsored by Phillip Morris, the cigarette manufacturer and, much less so than the more familiar syndicated versions of I Love Lucy, a haze of cigarette smoke permeates every episode. Ads before, after, and sometimes during each show hilariously/frighteningly extoll the health "benefits" of Phillip Morris smokes over every other brand. Their sponsorship also helps explains why housewife Lucy and bandleader Ricky Ricardo (Ball and Arnaz) and their neighbors/landlords, Fred and Ethel Mertz (Frawley and Vance) are constantly lighting up. In the original broadcast versions, blatant product placement was not uncommon. The four stars make the show funny. This Lucy, versus the characters Ball would subsequently play on The Lucy Show and Here's Lucy, wasn't the often-grating, sometimes infantile middle-aged dingbat, but rather an ordinary if eccentric housewife forever scheming to buy a new dress or, more often, enter the world of show business despite a total lack of talent. As Bart Andrews noted in his seminal book on the making of the series, the format typically pitted the women against the men, the Ricardos against the Mertzes, or Lucy against Ricky, always with Lucy hatching some wild plan that invariably goes horribly awry. These early I Love Lucy episodes are bereft of Hollywood stars, with more "pure" sitcom situations. The case could be made that I Love Lucy's second year was its best. The show was finding its voice in a few awkward first season shows and Arnaz, the least experienced actor among the four leads, is clearly uncomfortable in some of those shows. But here I Love Lucy was riding high as the No. 1 show on television, garnering a staggering weekly rating of 67.3, meaning more than two-thirds of every television in America was tuning in. "Lucy Goes to the Hospital" scored a 71.1 rating, the highest-ever rating for a television comedy or drama, a record unlikely ever to be broken. (Last season's No. 1 show, Empire had a rating almost exactly one-tenth of that, a 7.1.) 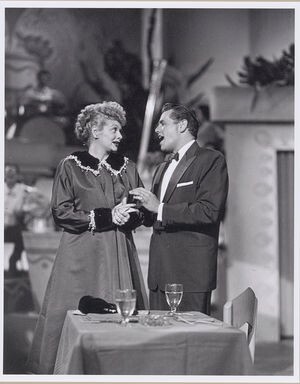 There was I Love Lucy merchandise (showcased on the show itself), like Lucy and Ricky pajamas, and the series hadn't yet succumbed to the allure of parading big-name guest stars to ensure high ratings. (That began in season three, with Tennessee Ernie Ford, followed by the Ricardos and Mertzes' Hollywood odyssey, which began in that year and continued into season four. No, I Love Lucy was riding high on its own merits, as a very funny show rooted in good, old-fashioned slapstick baked in precedent-setting sitcom plots - at least in terms of adapting them to household settings and/or '50s sensibilities. I Love Lucy looks quite good on Blu-ray, especially when one takes into account that these shows were more or less shot in real time, with cinematographer Karl Freund's crew having to scramble their dollying cameras into focus and in synch with the sometimes complex blocking of the actors, to and from multiple sets. The original network material (the network openings, bumpers, and commercials, preserved in 16mm) is in more dog-eared condition but still acceptable and the transitions are pretty seamless. The 2.0 lossless mono is also good when one remembers all the pops and crackles on 16mm syndication prints of yore. I found a few sync issues here and there, most noticeably on both the network and syndicated versions of "Job Switching." A Spanish Dolby Digital track is offered, and the discs are region-free. As before, all 31 episodes are presented two ways: viewers can choose the more familiar syndicated version of each show, or opt to view the shows as they originally aired (at a full 29:30 in most cases), complete with their original commercials and other filler, with different opening and closing titles and, rarely, with slightly different edits. Also included is a colorized version of "Job Switching;" radio broadcasts of My Favorite Husband; clips from Stars in the Eye and The Red Skelton Show featuring members of the cast; text material discussing various actors and anecdotes about the making of individual shows, as well as video clips noting flubs that made the final cut. The most intriguing supplement, previously released to DVD, is I Love Lucy a completed but never-released theatrical version of the show that combined several episodes. A wraparound story was shot featuring an ordinary, middle-aged couple (Ann Doran and Benny Baker) who attend the filming of an episode of I Love Lucy. They arrive and take their seats along with the rest of the audience. Next a genial Desi Arnaz, out of character, welcomes the audience, gives "the lowdown on all this television magic," explains how the show is to be filmed, and introduces his co-stars. Some of this footage is staged, but what's on-camera is the real I Love Lucy soundstage (then shooting at General Service Studios in Hollywood) and Arnaz's amusing introduction - he makes a funny joke about the 35mm cameras that would sometimes obstruct the audience's view of the performance - is about identical to the real pre-show introductions he routinely gave. In other words, to explain the existence of a laugh track on the feature version, the movie is explained as an actual performance by actors rather than movie "reality." The pre-show footage is fascinating stuff, a glimpse through a heretofore-lost "fourth wall," of a program engrained in virtually everyone's consciousness (like it or not). Another terrific package of material almost perfectly presented, I Love Lucy: Ultimate Season 2 is Highly Recommended. Stuart Galbraith IV is the Kyoto-based film historian and publisher-editor of World Cinema Paradise. His new documentary and latest audio commentary, for the British Film Institute's Blu-ray of Rashomon, will be released this September.